One of the indicators raised by my fellows was that everybody in the organization and especially the leaders are not just operating mechanically but also have an agile mindset and their de-facto decisions/actions show it. Examples that came up included “Letting Go/Stepping Back”, “Trusting the Team to pull”. This brought up a discussion where I played the Devil’s advocate (Oh well, I didn’t play it) – saying it was a problematic indicator. Why? Isn’t agile mindset great? Yes it is. And examples such as the ones raised as well as “Fail Fast”, “Inspect and Adapt”, “Iterate”, “Accept incomplete information”, “Stop Starting Start Finishing”, “Treat inventory as waste”, “We can improve/grow” (a.k.a the agile/growth mindset) can all drive great decisions/actions. My problem was with the position that all of these are required as part of a sustainable level. They portray a pretty ideal reality, but not necessarily what the organization/group chose as the goal of the transformation step we helped them go through. Some organizations will buy into the full monty and some will choose to break a waterfall process without moving to a real agile self-organization/decentralized control process. And for the latter ones just achieving a reasonable iterative flow of work can be a good stable/sticky level to grow from. Or they can aim for a reasonable level of cross-functional multi-disciplinary teams and the mindset that working together across silos is key to success in uncertain/complex environments. Or focus on decentralized control/self-organization. The focus can vary from organization to organization based on their pains/opportunities, their starting point and the transformation pace they choose to go for. Many people are breaking Agile into Process and Mindset. I prefer to look at it as different areas where for each area you can go through the motions mechanically (Shu-level?) or at a higher level also have the Mindset to help guide you and sustain your strength during tough patches. Said differently – It is not Process (Iterations, Commitment, Ceremonies) vs Mindset, It is different areas of potential agile value where for each there is the combination of Process, Structure, Mindset that together works to improve the way you work now and into the future. Therefore, when you plan for an agile change/transformation (and probably any other change as well) make sure you are clear and aligned on which aspects of the change you’re seeking and what would be good acceptance tests to check where you are in terms of Process, Structure AND Mindset in that area. Also when you talk about “Mindset” – qualify what “Mindset” you mean. This will also help you call for more concrete action/behavior and not expecting a religious like abstract approach to things. 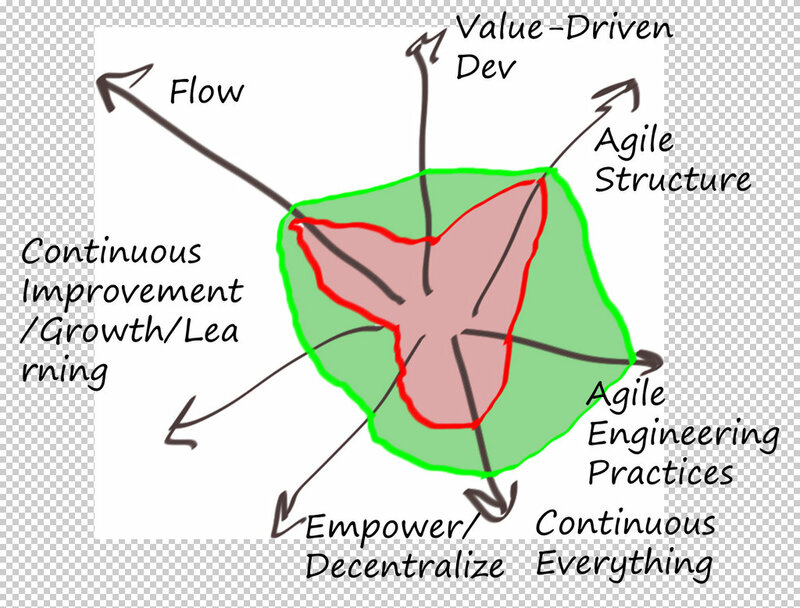 This entry was posted in Agile, Change Management, Management on May 6, 2015 by Yuval Yeret.